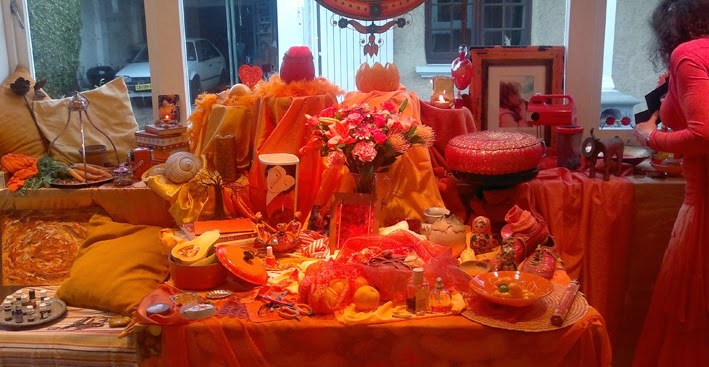 In the second week we explored the colour ORANGE. 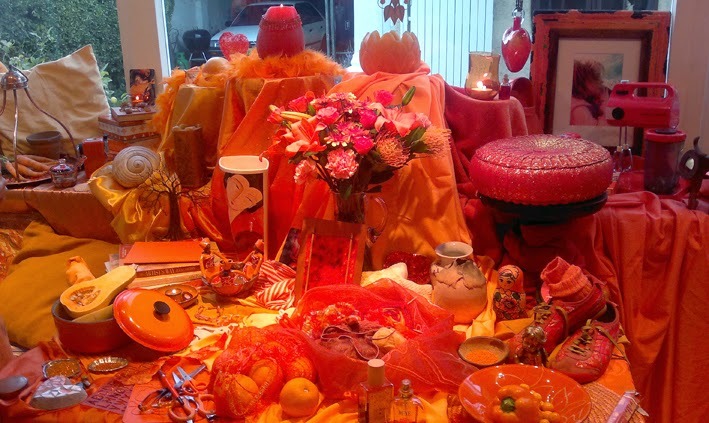 The carefully put together still life of various objects in shades and tones of orange was once again breath-taking. We sat around the still life soaking in the colour and smelling essential oils like Geranium, Cinnamon, Mandarin, Ylang Ylang, Clary Sage, Jasmine and Sandalwood. I used to love the colour orange, and still like it, but not as much. On this day it made me feel warm and inspired. There were a couple of people in the class who absolutely hated it. After mixing up paint in six shades and tones of Orange and a short meditation, we began to paint with 'intuitive spontaneity'. I covered my entire canvas sheet with a medium shade of orange, and then found myself painting bright flames dancing up the page. These flames soon turned into a swirling mess which then transformed into what looked like the close up of a peach that had been sliced in half to reveal the pip in the middle. 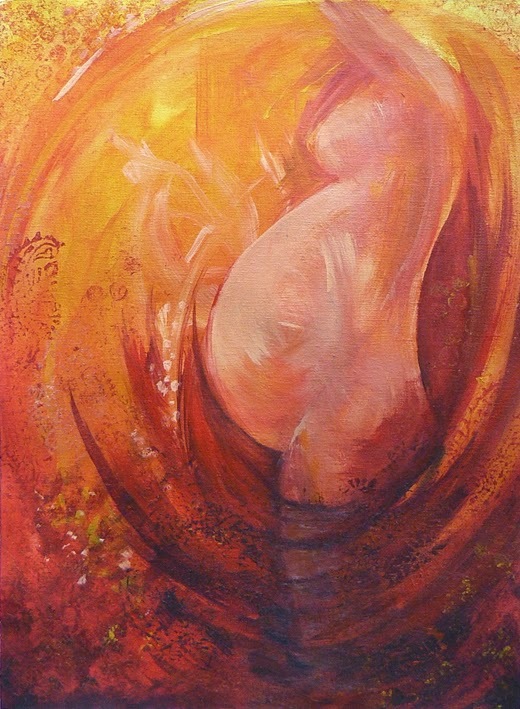 The peach pip then transformed into the belly of a pregnant woman. I made a decision at the start of this course not to refresh my memory by reading up on the different colours and Chakras. I had learnt a bit about chakras many (more than 7) years ago when I practised yoga, but could not remember exactly what each Chakra or colour was associated with. Needless to say I was pleased to see (but not completely surprised) that my end result did in fact tie in with the colour orange and the associated Chakra, the second Chakra. The second Chakra, also known as your Sacral Chakra or Swadhisthana, is located about 2 inches below your belly button. It is the seat of emotions and deals with issues of self-worth, creativity, relationships, empathy, nurturing, movement, change, pleasure and sexuality. The associated body parts are the hips, lower back, sexual organs, bladder, kidneys and bodily fluids. I also came across a Japanese Folklore tale about Momotarō, a boy who was born out of a peach.